now, i know fluorescent lighting isn't usually too warm and cozy, and some people just dont like it, but in a world where battery power conservation is of somewhat major importance, would fluorescent lighting be the way to go for an energy efficient TD or TTT? has anyone dabbled in the realm low voltage Fluorescent lighting ( http://www.lighting.spimin.com/LVFluorescent.shtml )? would it make more sense to purchase something from the link above and run straight off a battery system? Or would one be better off using a 120v fluorescent fixture run off a XXXX watt 12v 120v inverter? are there power losses involved in using the inverter? my TD would have an inverter anyway for HV power outlets, but would it be worth my while to run a lighting system straight off the 12v batts? i will not do LV incandescent lighting. in my experience as an electrician it has not been very reliable. it seems because LV incandescent bulbs require a higher amount of current, they tend to burn out faster, as higher current usually means higher heat. are there such things as 24v inverters? does anyone run a 24v system with two 12v batteries? okay, i think i've rambled long enough. any and all input is greatly appreciated!!! You're better off with 12 volt lighting. You'll loose about 10% effeciency running off an inverter. Also, inverters have a slight draw on your battery even when there is no load on them. 12 volt flourescent fixtures are commonly used in the RV industry. Any store or web site that sells RV parts should have them. The most common brand I have run into is Thinline. You may also want to check marine parts catalogs for 12-volt fixtures. I was also concerned about conserving power. My overhead cabin lights and galley lights are flourescent. I also have LED reading lights in my cabin. so, using LV fluorescents or LED's (another very good option i never considered!) would prove more efficient than running the lighting off the inverter it is probably more reliable too. that answers that question. i am assuming that the LV fluorescents have a relay or something so that their inverter does not draw power constantly? can anyone elaborate or should i harrass the manufacturer? i am hell bent on having HV power for outlets and what not. a switch in line with the 12v leads to the inverter would no doubt take care of the constant draw problem the inverter poses? just flip the switch when i want power, right? what about HV in from a camp site or whatever? does anyone use an integral battery charger that they can just plug in? can power be drawn while the battery is charging? i think it would be a neat idea to be able to switch my 120 v power from the inverter to a HV power source. again, all input is greatly appreciated! LED's are better for spot lighting applications. Even the best LED lights do not put out as much light as floursecents. I used my LED fixtures primarly for reading lights. I can focus a small amount of light on whatever it is that I'm reading without waking up my wife. Flourescents are far better lighting larger areas. I highly recomend that you read The 12 Volt Side of Life. Be sure to read both parts 1 and 2. It's a great primer on RV electrical systems. I will answer most of your questions, regarding batteries, inverters, battery chargers and the like. TomS.... I wondered about flourescents too, like for the galley and "porch" lights. Do you notice that they attract bugs pretty bad at the camp ground? I don't want to sound like a hillbilly but my dad built this house, and out back and upstairs off the laundry room, is a set of stairs going down. He put a 4' flourescent light about that exit door and it is on day and night and I think I only have to replace the bulb about every 18 mos! I notice even in the summer, the moths and such are not too too terribly bad there. Even if you get 120v flouro it will include an invertor to up the voltage to the very high voltage needed to run a tube. the difference is that you will be running 2 invertors one to get to mains voltage and another to get from mains to the extremely high voltage needed for tube. 120 volt fluorescent lights do not use an inverter, but rather a Ballast or transformer. an inverter changes direct current to alternating current. whereas a ballast or transformer in a fluorescent fixture increases and controls the voltage in order to excite the gasses within. I went with all led lighting and seams to work very well. I bought some leds from a yacht parts store out of Florida. We only have one trip, our maiden voyage to Florida, under our belts. When we were camping down there our galley light attracted a lot of small black flies. But, It didn't appear to be a major problem. Since the climate down there is a lot different than up here in New England, I have no idea if we'll experience similar problems camping around here. Indeed inverter is the wrong word, I knew the voltage was increased to excte the gasses and used the first wordm that came to mind. I had an enclosed car trailer built and when I wired the interior for both 12-VDC and 120-VAC, I also installed an inverter. I connected the 120-VAC output and my shore power cord to a 20-Amp Rated 2-Pole Double Throw Toggle Switch. When you have shore power, flip the switch up, when you want the inverter flip the switch down and turn on the inverter. 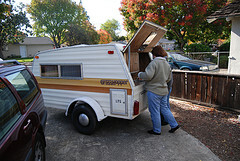 It works well for my car trailer and I plan a simular installation on my Teardrop. I have many inverters including our mountain cabin that is 100% Solar and inverter (6-Batteries) E-Bay is a great place for bargain priced inverters. Fluorescent lights don't like cold weather. The tubes tend to burn out and the ballasts fry trying to light them. Cold weather ballasts are available but I haven't seen them in 12V. I abandoned my fluorescent light and converted it to LED after I went through 2 sets of tubes. I have enough light with this setup, but not as much light as the fluorescent put out. Also, my current draw went from 1.2 amps to 0.4 amps. The color rendition of the fluorescent lamp was better than LEDs. The crappy lamps that came with the fixture were replaced with high CRI lamps (80) and it was a big improvement until they burned out too. The lamps burned out the first time I tried to use them in 50F weather. Here's a picture of the LEDs. It doesn't really show the light distribution since I had the garage lights on and used a flash for the picture but it gives you an idea of what I did. I can take a picture of them in the dark if you'd like to see what they're like. I have a picture of the fluorescent light in the dark so you could see them side-by-side. We pretty much use our garage as our main entry, there are times when I find a UPS delivery at the front door and have no idea how long it was there. I hated the pip-squeak bulbs in the garage door opener. They were dim and kept blowing out due to the vibration, yes I tried appliance bulbs as well as garage door opener bulbs. I ended up putting a plug adapter in the bulb sockets and plugging 2 shoplights (each opener has 2 bulb sockets) into the opener. I have 2 openers so that made 4. In total, I have 12 double tube shop light fixtures in the garage (3 car garage). I do a majority of work at night so I wanted enough lighting. As stated in a prior post, they don't like cold weather. They will buzz and flicker on occasion but usually they will just have reduced output till they warm up. If it's only cold at night, I will turn them on at dusk so they they can warm up. Yes, they do attract bugs but no more than any other lights. The June bugs love'em. As far as installing them in the galley, I've heard that they will make an FM radio buzz if it is too close. what kind of ballast were you guys running when you had the cold weather problems? new electronic ballasts are much more efficient, and have less problems with start up,though im not sure if they handle weather better. they come in "instant on" and "Flicker Free", which could not be said about old magnetic ballasts. magnetic ballasts are being phased out all together because of energy conservation code, at least in california, that is. i do like the idea of LED's, just not their crummy lumen count. 100,000 hour life is sweet, along with miniscule power usage; which is a key aspect of running any battery powered system. a comparison pic would be GREATLY appreciated! Note that even though there's less light with the LEDs the lower cabinets look better becasue they're not in a shadow. I added the lights at the bottom of the hatch after looking at the original fluorescent photo. Hope this helps. P.S. I haven't camped with the LEDs yet but the fluorescent lights attracted a lot of bugs. I was thinking about lining the lense with some kind of yellow plastic to help.